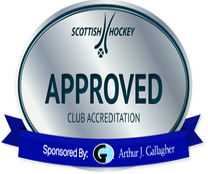 Hello and welcome to Dunfermline Carnegie Hockey Club. The club offers a range of playing opportunities from ages 5 to 60+ whether new to the game or with past experience. We also support the development of coaching, umpiring & club officials skills. All our coaching, playing & training takes place at Woodmill High Community Use School, Dunfermline KY11 4ER using the outdoor synthetic pitch & adjacent indoor facilities. All players must wear shin pads and a mouth guard/gum shield is highly recommended for every training/game session. We recommend hockey specific footwear for use on synthetic surfaces. All studded/bladed football wear are unsuitable for use on synthetic surfaces. Coaching every Tuesday & Thursdays for ages 5 to 14 years during the school year 5.45pm to 7.00pm at Woodmill High. Membership for men & ladies – come along, meet & play with us before deciding.